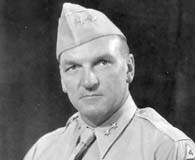 On other West Pointers: There was a great guy there who worked with General (Leslie) Groves on the Manhattan project in World War II named John Jannerone, and he was a Rhodes scholar, and he wound up his career as Dean of Academics for many years at West Point. The vast majority of people that I met there were really, really first-rate people. Coach Knight’s 2008 Army Sports Hall of Fame induction: Colonel Earl “Red” Blaik [West Point football coach, 1941-58] was there, as was [former West Point hockey coach] Jack Riley, who coached the U.S. Hockey Team to the Gold Medal in 1960 in Squaw Valley. 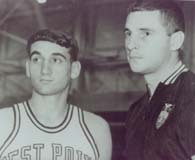 Also, [former West Point coaches] Joe Pallone and Eric Timpton were there. So all four of those guys I knew came. I had a tremendous relationship with Colonel Blaik, and he was one of the great coaches in American History, and I got to know him and spent several really enjoyable hours talking and asking questions of him. 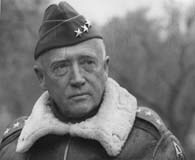 On Gen. George S. Patton: He gave his players something different than the normal coach would give his team, and that was Patton and who Patton was and what Patton was, and how they could really, in the end, count on Patton. And then the second part of it was he just seemed to have a knack of knowing where to go. Like we’re not going to go across this river and swim across it; we’re going to go build a bridge down here so we can cross it, and we don’t need to go through these, we don’t need to take these fortifications, we’ll surround them and go on to fight somewhere else. [Gen. Douglas] MacArthur is greatly criticized because of his ego and, yet, probably if it wasn’t Patton that did it, MacArthur probably operated against more enemy personnel in the South Pacific with fewer casualties than anybody in history. Family Military Background: I don’t have much of a family military background, except way, way back, I had ancestors that fought on both sides of the Civil War. And then during World War II, I had an uncle that was a Commander in the Navy. And outside of that, that’s all the military background I have. I had a great, great, great uncle that got wounded in the Battle of Peachtree Junction in Georgia [Civil War], but not much that I know of beyond that. On Generalship: Look at the lack of success that Lincoln had in the Civil War until Grant came along. Grant differed in approach from some people obviously, but his approach ended up winning the war. There’s a book on Grant and Lee that kind of debunks the whole theory about Lee as a superior General. And Grant, by the end of 1865, Grant had never been in a losing battle.